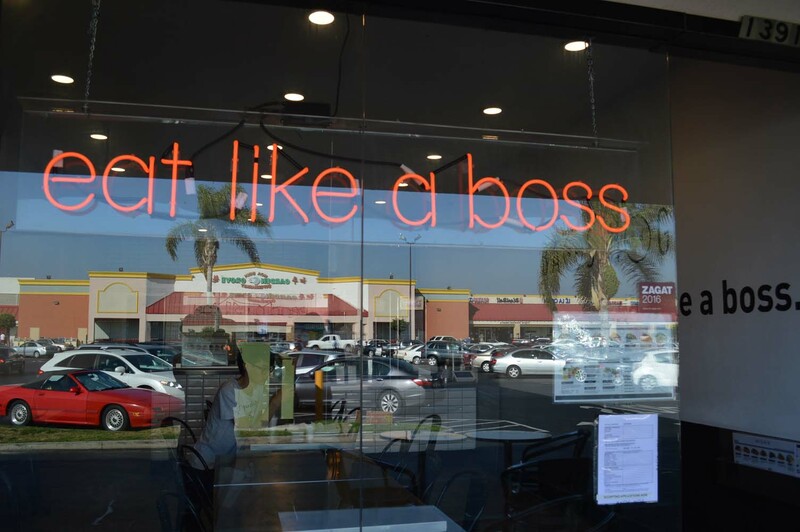 This Is Where You Can Eat Like A Boss In Little Saigon - Baos Hog - EAT WITH HOP! The prices for the baos (what I usually get here) are reasonable for the size! A lot of people say it's expensive... and yea it can get pricey if you need to get a lot to get full, but I think the price is fair! 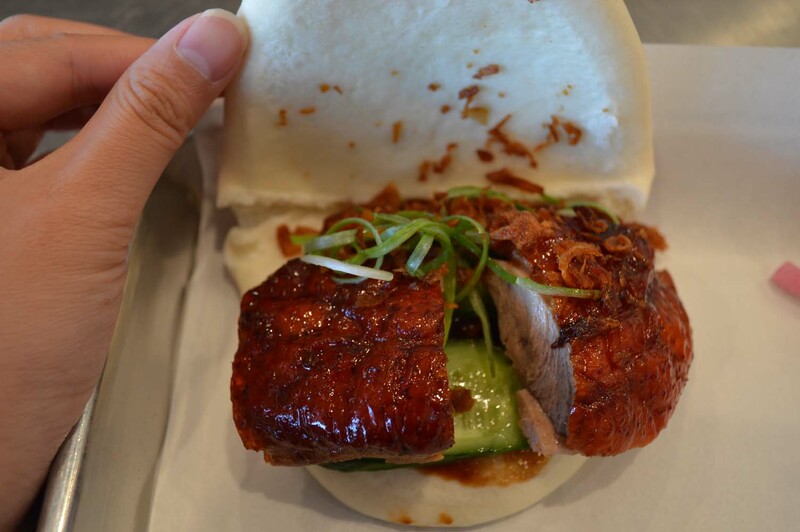 At around $4, you can get a fresh steamed bao bun with fillings such as duck, crispy pork, fried fish and more! Basically I get bored of it real quick because it's just fried flour with some cinnamon. 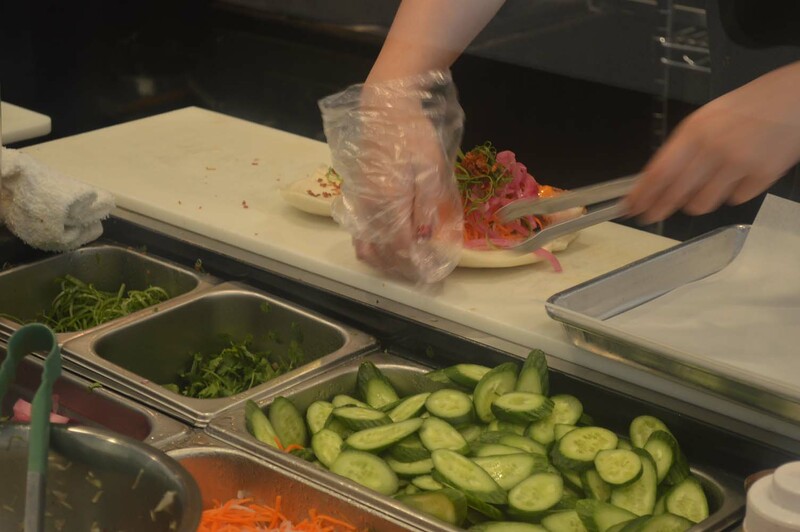 You can watch them assemble your bao sandwich / taco ! Yum! THE CRISPY PORK!! THIS IS CALLED THE BOLSA WHICH HAS CRISPY BELLY (PORK)! LOVE THE SKIN! I FORGOT WHAT THIS ONE WAS... UHHH WAS IT BBQ PORK?! SEEE?! It's huge! Okay not really. 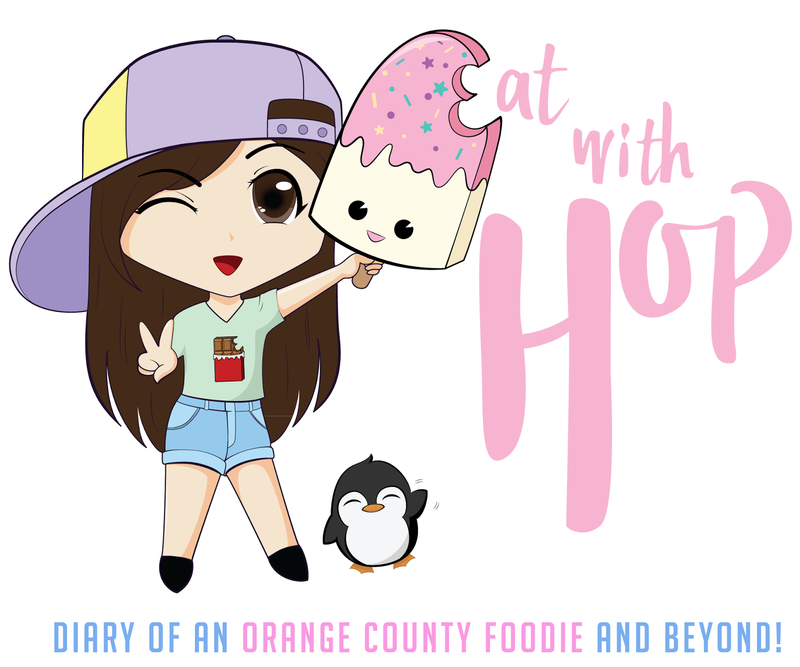 But if you've heard of The Bun Shop located in Korea Town (Los Angeles) then Baos Hog is by far bigger in portion at a cheaper / more reasonable price. These are the CINNABAO FRIES! They look so good right?! But they get boring real quick. It's better to just share it with a bunch of people because Kevin and I couldn't finish it alone. After 2 pieces we were done. They serve it with whipped cream. I also think they need more condensed milk. 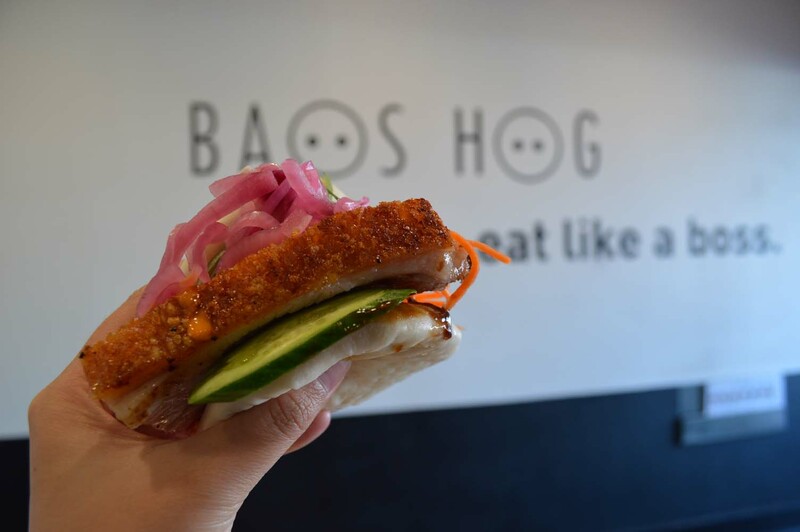 Baos Hog is the answer. 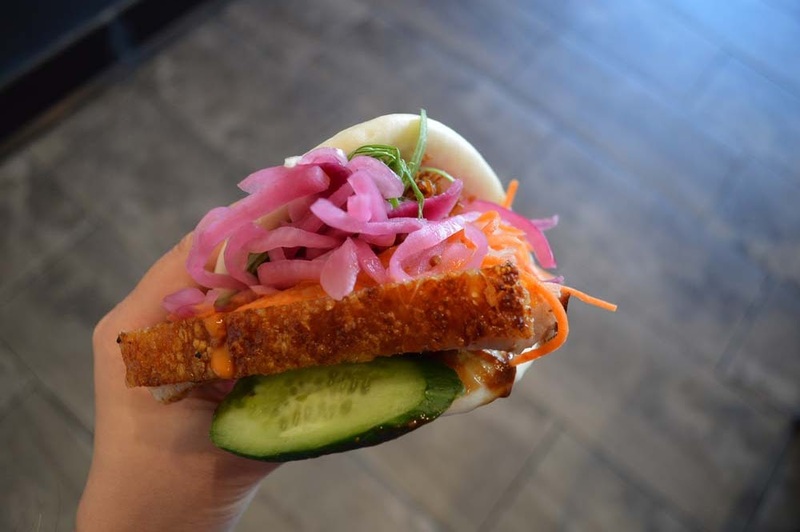 They serve up a sorta Vietnamese – Chinese by basically creating bao bun sandwiches or tacos with fillings like duck, crispy pork belly, fish, beef and more! The portions are fair for the price and if I was rich, I would come here more often. 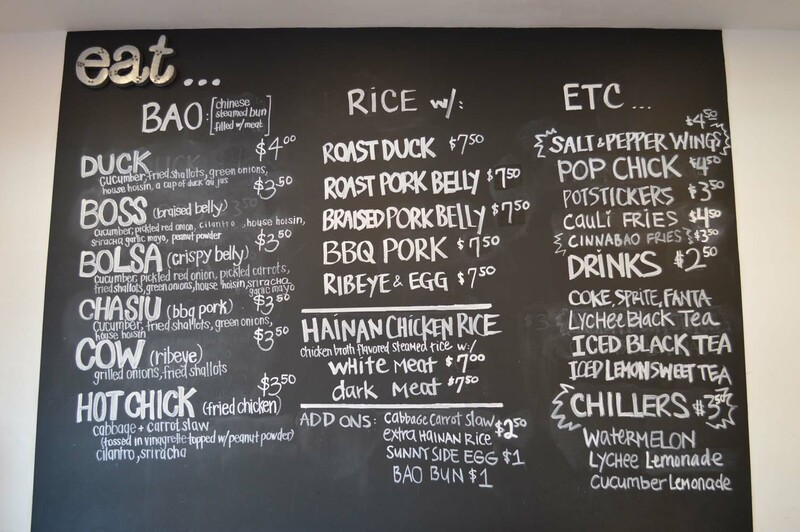 When Baos Hog first came out, I would compare it to The Bun Shop in KTown LA which basically had the same concept. The only difference is the cuisine. Baos Hog is more Vietnamese / Chinese influenced and you can tell by the fillings: pickled veggies (carrots and radish), cucumbers, crispy pork (typical at Chinese / Vietnamese restaurants) and duck. 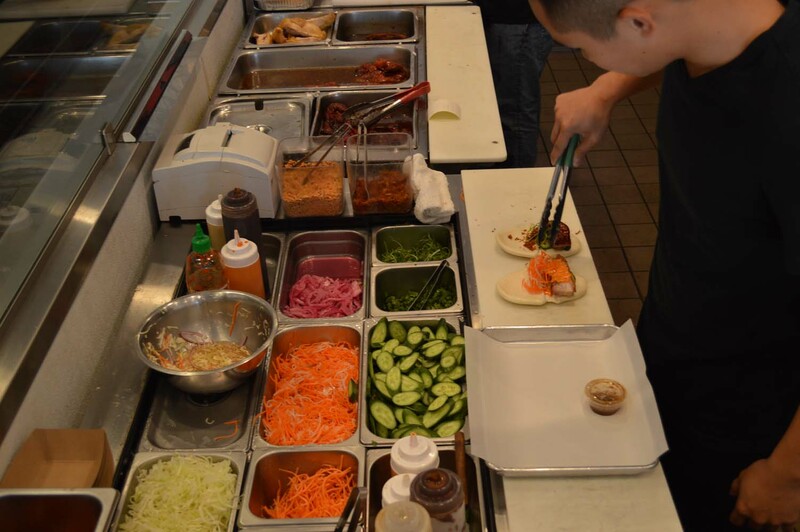 The Bun Shop served bun “tacos” that were more…. Korean / Japanese influenced with fillings such as katsu pork. So I wouldn’t compare that one is better than the other. I think it depends more on what you want to eat. More Viet/Chinese or Korean/Japanese buns? The biggest notable difference is in portion sizes and pricing. The Bun Shop buns are so teeny tiny when compared to The Baos Hog. The Bun Shop has a combo of 3 buns for about $10 but the buns are smaller than my hand. Whereas Baos Hog buns are about $3-$4 but are as big as my hand and fillings are generous! 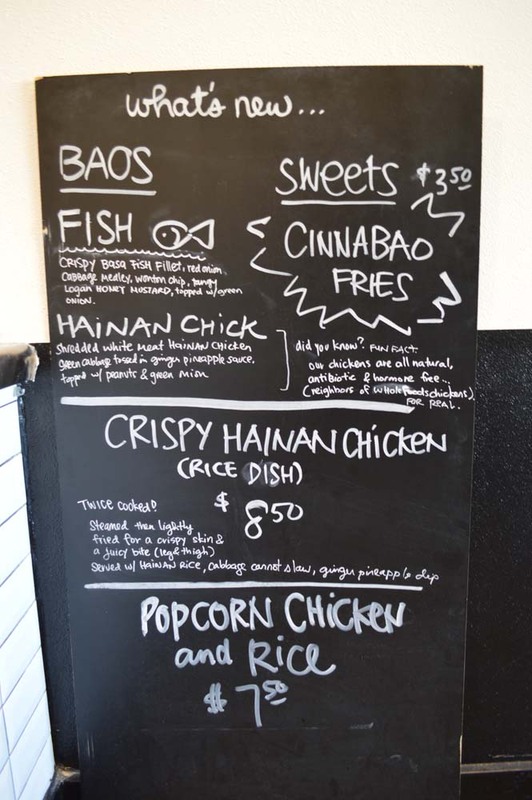 Recently, BaoHaus by Eddie Huang, a famous shop from New York, just opened in China Town Los Angeles. I haven’t tried their food yet but I wouldn’t doubt their portion sizes being smaller than Baos Hog (since it’s from New York, a place known for expensive – small portion). 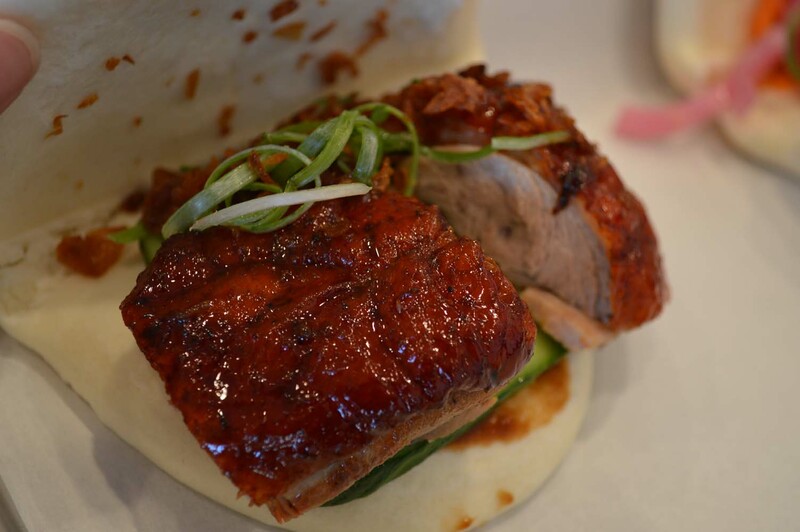 Both The Bun Shop and Baos Hog are delicious and different! I LOVE THE DUCK! When in doubt just get the duck! You’ll be reminded of all those weddings at Chinese restaurants you used to go to as a kid (or is it just me?). I also love The Bolsa. I HEARD THEIR HAINAN CHICKEN IS GOOD TOO. I haven’t tried anything other than the Baos here but people tell me their Hainan Chicken dish is a top seller! IS THIS WORTH THE DRIVE?! Awhile ago, when this was all the hype, people would ask me if it’s worth the drive. I think it really depends! 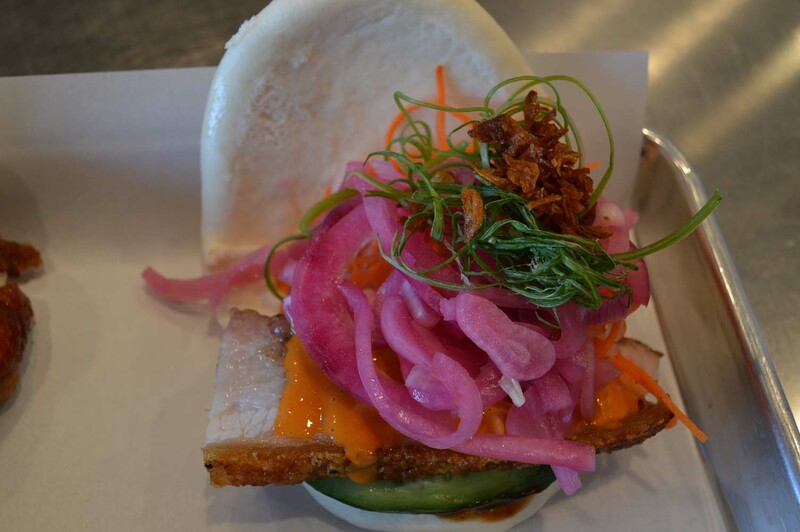 It’s worth the drive if you wanna try Vietnamese style Bao Buns! To me, I really enjoy eating here! Most of my friends think it’s expensive. Even Kevin thinks it’s expensive. I think… yes. It is expensive for the area. 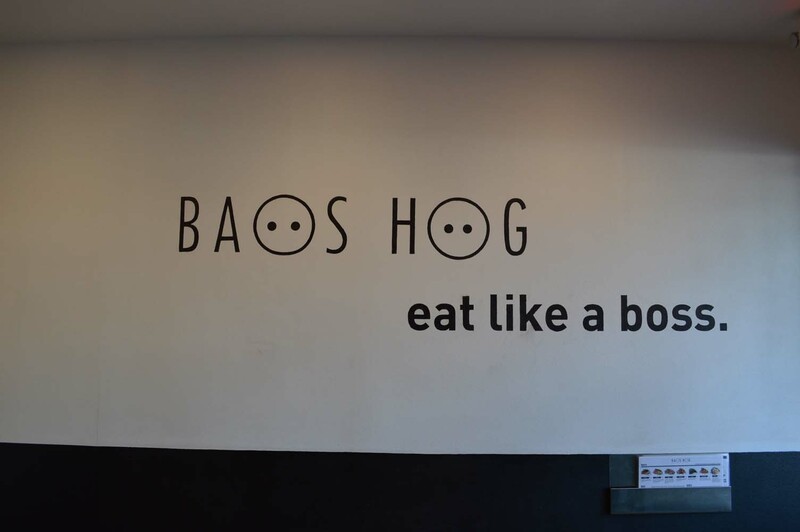 Little Saigon is known to have good cheap eats so Baos Hog is kinda pushing it. But I think the pricing is fair for the big portion since I know how other places are like (such tiny buns at other places). Obviously, this is really expensive if you wish to eat more than 2. I would eat like 4 or 5 if I could but I get full after 2 or 3 buns.